Looking at AS's I haven't tried yet. Hit me with YOUR description of the Floid scents. In my opinion, nothing beats the Floid Blue. The Masaje Genuino (orange) is a bit more musky than the blue, but both scents linger for a very long time. It is my understanding that the blue is hard to get these days, but I hope to find some more to replenish my near empty bottle. I'm sure you'll be impressed with any Floid you may acquire. Last edited by Firefighter2; 05-26-2018 at 12:56 AM. I remember I sent a bottle to MikeB52. He hit me as soon as he loaded-up on it! I want the blue. I understand it was discontinued? Firefighter2, rolodave, Haroldg48 and 1 others like this. I think it is discontinued, but hopefully there is a stash of reserves somewhere! sharptonn and rolodave like this. I have never used the original so I can't say anything about this 'Replication'. 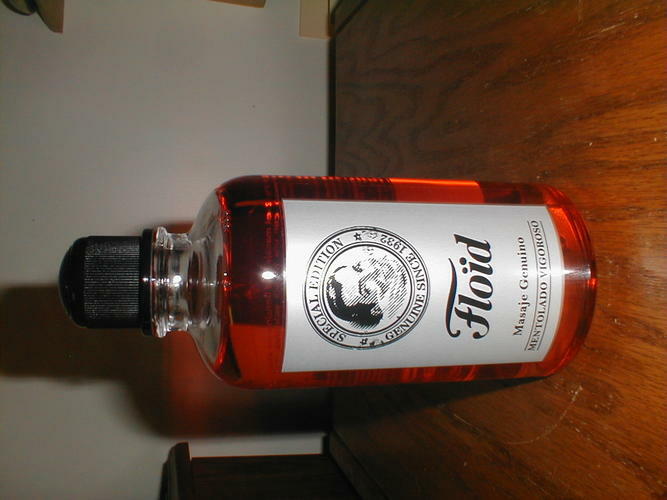 Years ago I tried a bottle of Floid in the orange color. It smelled like candy. I got rid of it. Thanks, Roy! On the way! Stiff shipping, but I was strong enough to not look at the other merchandise! an after shave lotion that can also be used on the body. My wife made me get rid of the Floid Black. Said it smelled like body odor. The other Floid scents are well liked. Last edited by rolodave; 12-22-2018 at 09:32 PM.